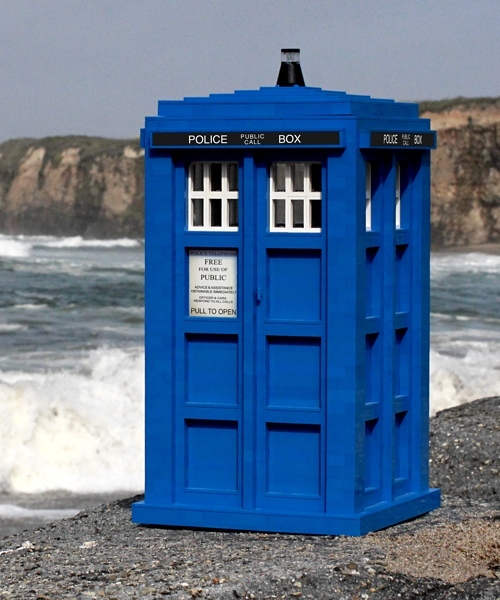 Over a ten-day period last June, a LEGO® TARDIS slowly materialized in my living room. 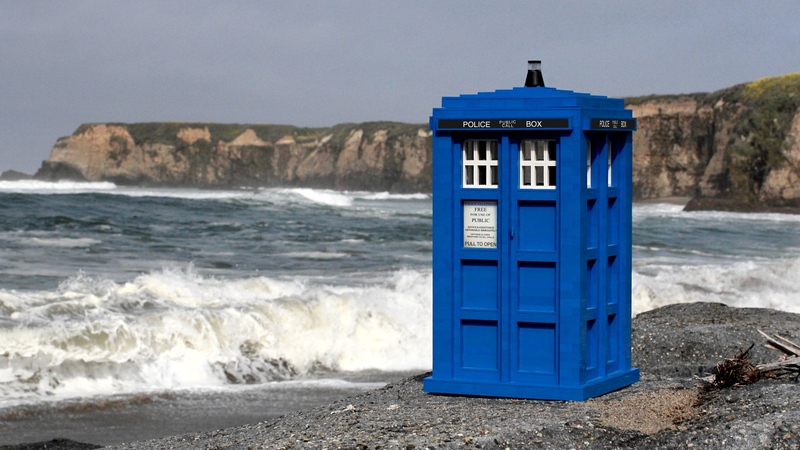 For those not in the know, a TARDIS is a space- and time-traveling vehicle from the British science-fiction show, Doctor Who. Consisting of over five pounds of Bright Blue #23 LEGOs blocks and plates plus a few black, white, and clear pieces, the mini TARDIS is just over 15 inches from base to beacon. A few special features include a cookie-jar-like design — the one-brick-wide walls surround an empty core and the roof of the TARDIS lifts off, the light beacon making a convenient pull knob. Within the base and the left-rear column are two one-by wiring conduits, making future lighting or sound customizations a much easier proposition. The Stage #3 photo above shows the rear of the TARDIS; you should be able to make out the entrance hole of the conduit at the base of the corner column. The front door is removable, although not easily; minor deconstruction is required. More than 1,500 individual pieces were used in the construction, sourced from my son’s LEGO collection, six different LEGO stores, special orders from stores in several states, and even a delivery from Poland. Initially, my design was more modular: I pre-built the door and window panels separately, fitting them on to the base between columns and using the roof to lock in the doors. However, the door panels are structurally unstable — every time I picked up the TARDIS to view at different angles, it imploded. A new computer-aided design allowed for a near uni-body construction of all but the front door panel to allow its removal. 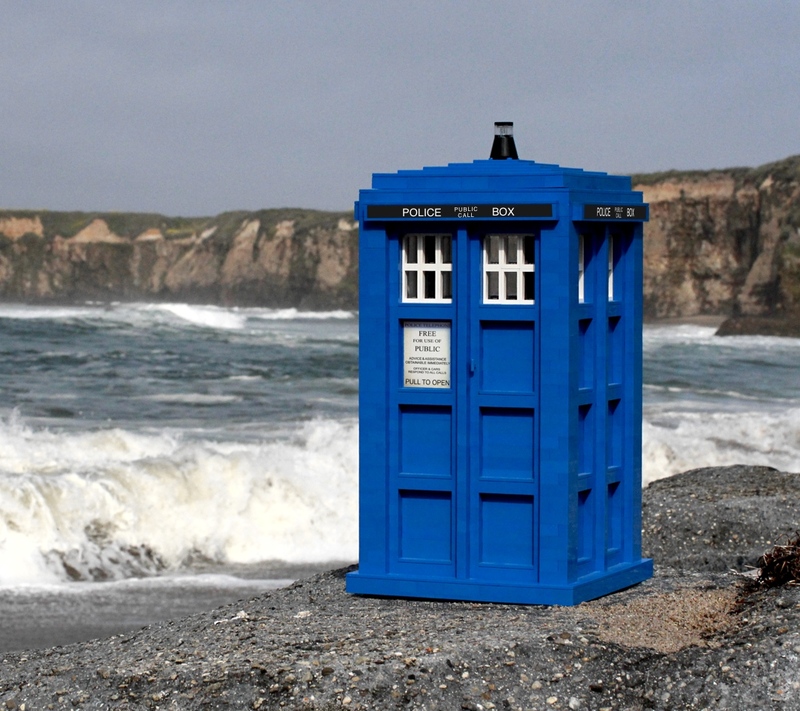 Commission rates for this TARDIS model start at $750, and do not include shipping and handling charges or signage. Please contact me for additional details. Several sizes of wallpapers of the artist’s proof model are available below. 768×680, 1080×960, 1366×768, 1440×900, 1920×1080, 2560×1440, 2560×1600, and 2880×1800. Click the link of the desired size to open the wallpaper in a new window. Right-click and choose “Save Image As…” to save the image onto your computer. If you post these on your own site, I ask that you provide proper credit to me as the artist, and also please don’t hot-link the images directly from my site. Unauthorized commercial use of the photographs is prohibited. 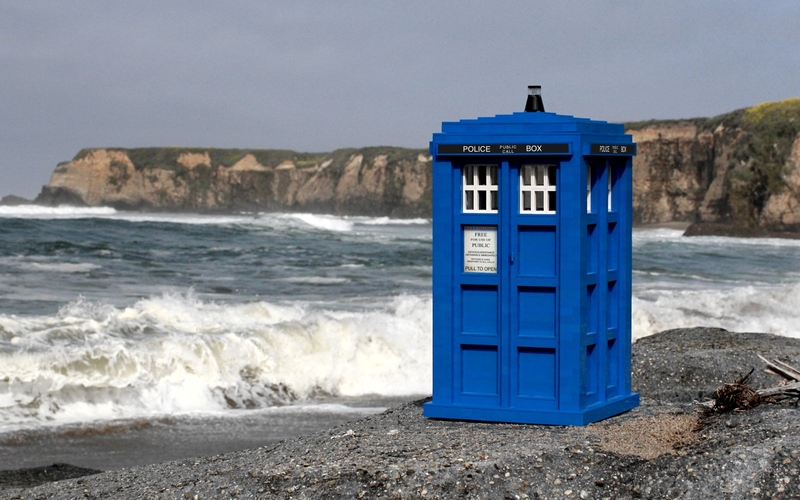 Almost two years after building was complete, in April 2013, I transported the TARDIS to Davenport Beach near Aptos, California — it’s the closest I could get to somewhere that approximated Bad Wolf Bay. The pictures of the completed TARDIS and wallpapers were added to the site in June 2013, included computer generation of the signage. Due to transport difficulties for the art piece, portions of the bottom and top fourths were glued to ensure its permanency.